Home Entertainment Are You Curious About the Latest News of Rain and Kim Tae-hee? You might already be familiar with the married couple Rain and Kim Tae-hee. Rain was originally a soloist that made his debut back in 1998. He was only 16 years old when he debuted in a boy-group called Fanclub, but the group failed and was disbanded. In 2000, Rain was recruited by JYP Entertainment and became a trainee there. Two years later he debuted again, as a soloist, with the debut song Bad Guy and immediately became a hit! Rain also made his acting debut in 2003 in a drama called Sang Doo! Let’s Go to School. It was a little different with his wife, Kim Tae-hee. She began her career as a model when she was offered a modeling job while she was riding a bus. In the early days of her career, she was offered spots in some commercials and advertisements. She finally made her official debut as an actress in a drama called Last Present, in 2001. Since then, her popularity has continued to rise and she’s sometimes called the most beautiful woman in Korea because of her youthful and natural appearance. Rain and Kim Tae-hee first met when they were working together in Rain’s music video, Love Story, in 2010. The following year, they met again when they worked together for and ad for a social commerce company, Coupang TV. That’s when they realized that they were developing feelings for each other. Two years later, in 2012, when Rain was in the military service, Dispatch caught them together in Rain’s car, going on a date. After being caught out together several times, their agency confirmed their special relationship in 2013, and fans greeted the news with both positive and negative responses. They even went to BBQ restaurant together and were once again caught by the media, but that time, they were more open about their relationship. Rumors about their marriage started to circulate among fans when Rain was seen in church with Kim Tae-hee. People suspected that Rain was converting to Catholicism, which was Kim Tae-hee’s religion, and he was baptized there. After dating for five years, the couple finally announced their marriage. Rain revealed that his wife wanted a small marriage ceremony. They held their marriage at the church and they didn’t have any pre-wedding photoshoots. After the wedding, they were spotted in Bali for the honeymoon. Nine months after their marriage, they welcomed their first daughter, who was born on October 24. 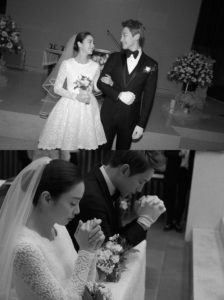 Congratulation to Rain and Kim Tae-hee, let’s hope for their happiness!